After 4 years of focusing on analyzing financial news for sentiment RelateTheNews is adding a new source of analysis data to their portfolio of alternative data, SEC Edgar filings. Applying the proprietary AI and natural language processing (NLP) engine created by RelateTheNews to SEC Edgar corporate filing data will provide RelateTheNews clients with an effective industry leading new alpha driving set of alternative market data. This new alpha powering alternative data from the powerful real-time sentiment analysis engine created by RelateTheNews will be available in early Q2 2018 for our existing and new clients. In a first for RelateTheNews we have open sourced one component of the new SEC Edgar Sentiment data as a service (DaaS). This component aptly called the go-edgar-getter provides a Go package for concurrent retrieval of SEC Edgar data. 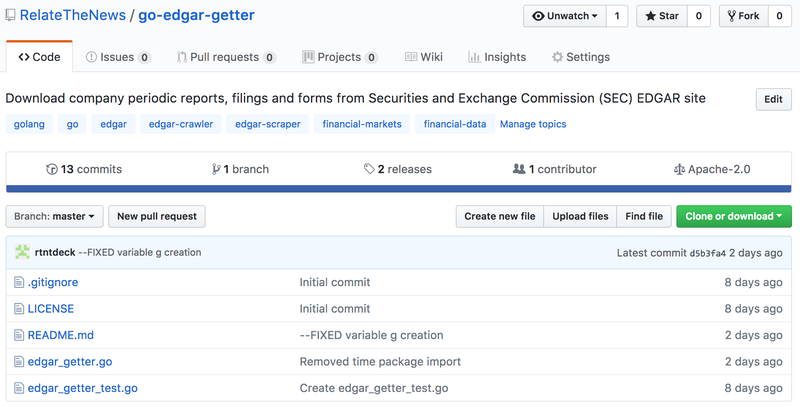 The go-edgar-getter will add to the extensive set of open source tools available to the financial industry and data researchers. Contact us today to learn how our sentiment analysis engine and SEC Edgar filings by corporations, funds, and individuals filing data can aid your quant hedge fund, quantamental fund gain an alpha edge.